One perfect eventide as the last rays of a late September sun were yielding to dusk; a splash of warm sunlight lit up the side of my home in Tujunga Canyon. It was too rich an invitation to resist and a young bat pup left his home in the nearby crevasse earlier than usual to land with a smack against the warm stucco and spread his wings to absorb the forbidden sun. Recently I’ve read local alarmists’ warnings that rabid bats have been found in Ventura County and how we ought to wage war on bats. It’s hard not to read those people a list of their lineage. Two more dead rabid bats than normal (normal is 10 a year) have been found (out of gazillions) and suddenly there’s a rush to judgment by the uninformed. Rabies is a common disease. Vaccinate your domestic animals. Every mammal is susceptible except the wondrous Opossum who is immune. So how about a few words of praise for the bats among us? The bat is the only mammal to conquer the miracle of flight and look what he can do! They fly 60 mph and up to 10,000 feet high with maneuverability mere birds will never possess: performing aeronautics we can’t appreciate except with slow motion photography. Baby bats ‘babble’ according to 2006 National Geographic and they do so to practice their eventual speech which is sonar. The only other baby mammals who practice speech pattern in this way prior to ‘conversation’ are whales, dolphins, and humans. The sonar called echolocation allows them to find airborne prey and consume 5000 insects (per bat) every night to satisfy their voracious insectivores’ appetite. That’s a ton of West Nile Virus carrying mosquitoes! When they swoop near humans they are actually saving you from mosquito bites as the bats deftly eat the very insects drawn to your body heat at night. I know it’s tempting to swat at them (though you don’t even come close!) but think of the illness they just saved you from. When the insects are gone so are the bats. Bats are the only major predator of night-flying insects (mosquitoes, midges) and countries where mosquito vector disease is a problem have a shortage of bats and their habitat. I have created numerous bat habitats for homes near lakes, streambeds and marshes. Areas without waterways are equally prone to disease carrying insects especially in suburbia where standing water is overlooked everywhere and mosquito larvae abound. 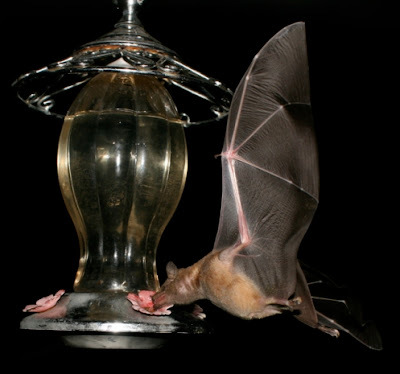 Bats need water desperately so the first thing you want to provide in your habitat is hanging water sources like hummingbird feeders with insect based water solutions (available at better pet and feed stores). If there is a call for it I will provide a follow up article here on creating your own bat habitat. Bats also perform miracles you never hear about; they pollinate night blooming flowers most notably the Agave that produces Tequila and agave syrup. They ‘feel’ earthquakes coming; a colony flying in the day is a bad sign. They produce young in relation to ideal conditions; they never overpopulate, but respond to insect levels so more night-flying insects yield more bat births. They are good mothers, nurturing their young longer than necessary and carrying them clinging to their chests while they hunt. They make no nests and wrap their babies up tight in their wings to warm them while they sleep. Bat Guano is worth its weight in gold; it’s naturally high in nitrogen and phosphorus and trace elements and contains no impurities. It is usually protected from rain in the bat's hiding places and therefore is not diluted. It began as plant life consumed by insects that were eaten by bats and is a rich concentration of plant nutrition. It is one of the finest fertilizers and soil amendments known. One came into my house a couple of summers ago through the back door, open to let the cool night air in. I threw a towel over him to lift him while inducing the least terror possible to the poor thing, too terrified by having flown into a lighted room to move. He happily flew off when I returned him to the dark outside. And you are so right about their incredible speed, disappearing once in the air. But I was most amazed by how small he was, really no bigger than a hummingbird, and as fragile and light. Thank you for your story, and the reminder of my one brief moment with the bat. I'm so glad you all liked the article, please try to get the word out to those who are anti-bat that they are harmless and valuable creatures. Many thanks to Meg whose photo and link are in the article... I spent hours enjoying her two blogs; be sure to check them out. I have always been fascinated by bats, too, maybe because I am one of those people that seem to be especially attractive to mosquitos! I'd love to create a bat habitat with you. That would be wonderful Patrice! I would love to build a bat habitat, and children can get involved! The habitats are so desperately needed now as we encroach on the bat's natural world. And West Nile Virus outbreaks have come closer and closer to our area; the bats are our best defense, far better than mass spraying of pesticides!